Friday morning I went to say goodbye to Art3mis when I pulled back her fleece and found 3 SQUIRMING LITTLE BABY HEDGEHOGS under her fleece. 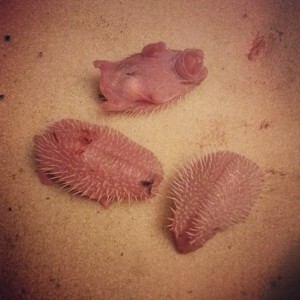 The Hedgehog Welfare Society was told that the two female hedgehogs were housed separately from the male hedgehogs, so Art3mis immaculately conceived her babies. It all makes sense that Art3mis seemed more distant from us every day – that’s what future hedgehog moms do when they are preparing to give birth. SO, crazy surprise for me that morning. I called in to work saying I was running a little late and might possibly need to take a half day because I needed to find out what I had to do. After doing research, the word is to take out her cage and do nothing for 2-3 weeks and be very quiet. We only hear Art3mis when she runs out to feed and have only caught glimpses of her. So freaking surreal to have tiny baby hoglets in there but we can’t check in on them at all. MADDENING! This week: Music Box with Z and Jason Anderson for Night Moves. Daddy’s Gonna Kill Ralphie, Z’s high school friend Toby’s band @ Burlington. $6.50 Movie @ Regal City North. Dragonlady. Music Box to see Filth with Q&A by Irvine Welsh. Sold at Renegade Chicago Mini Market @ Mana Contemporary – what a nice space, wonderful customers old & new, and great vendors – I loved splitting the booth with Betsy of Foxglove Accessories. Dinner at Bite. Sold at RCF Chicago Mini Market Day 2. Additionally, I made two brand new cards to debut at Renegade Chicago Mini Market; a Malort birthday card and a lady date card! They are up in the Rhymes with Twee Etsy Shop. One of the best movie weeks in some time. Night Moves really did a number on me. It compared extreme environmentalists to the people they are trying to convince that large changes need to be made in our countries/lives. Dakota Fanning is truly one of the great film stars of today. It was a really stressful film to watch. Felt like The Cove meets early David Gordon Green cinematography. Masterful filmmaking by Kelly Reichardt. How to Train Your Dragon 2 was even better than the first. I LOVED the message that, even with a physical disability, you can do amazing things, even better than others. I read a number of articles about the film because it struck me so. One interesting article on The Dissolve called We’re losing all our Strong Female Characters to Trinity Syndrome was one I disagreed with about Valka in this film essentially not having a point. SPOILER ALERT. SPOILER ALERT. SPOILER ALERT. Her role is not a throwaway one. She never went back to the island after being taken away during the dragon siege because no one ever listened to her that dragons could be allies rather than enemies. Listen to a woman? No way! She did a brave thing by going against the social norm; killing dragons, and finding her own path of studying/befriending dragons and this was A MAJOR plot point in WHY Hiccup became Hiccup. I felt there was a good amount of time on Valka in the film. When she was attacked at the end, her pacifist nature came out and she just could not bring herself to kill. This is her true nature – how could she kill a dragon? Yes, it is a truth that we need more strong female lead characters in film, but Valka was a strong supporting character who stayed true to her convictions, and she was one I was very glad to see. NY&CH:RNS was good to have on in the background while I was editing photos. Bad Milo! was pretty bad, but fairly fun. I knew James McAvoy was a great actor, but in Filth, man, he proves he is multi-dimensional. The film was good, but it felt like something I’ve seen numerous times before. My friend Carmen is running the Chicago Marathon on behalf of Back on my Feet and her and her friend Brittany have started Rise and Run. For a $20 donation, after their Saturday morning training, they deliver home baked goods to your doorstep selected Saturdays from now through 10/4. I got my first delivery and it is so awesome. HIGHLY RECOMMEND! Baked goodies for good! A few weeks back, I talked about a friend having a hard time. That friend is my longtime friend and former roommate Rani and I put together a Give Forward campaign to help her re-set her life after her suicide attempt this winter. A lot of things lead to that attempt, but she has made and is continuing to make great forward strides. I’m trying to do anything I can think of to help and I would be grateful to anyone who would share the campaign link or give $5, $10, $20; anything will make a difference in her life. This week: First meeting of the UVNA with our board. Tried out Tatoco with Z & Stacy. 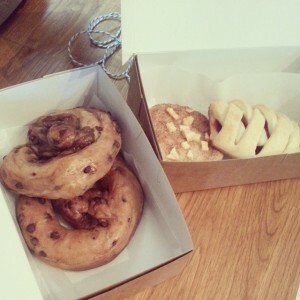 Carmen dropped off baked goods for Rise & Roll. Unwindulaxed with a lot of How I Met Your Mother. Dinner at Native Foods with Z, Kirstie & Jason. Cocktails @ Takito with Alison & Emily. Bite/Logan Square Farmer’s Market with Jen S. Jason Anderson showed up and we watched The Room with Stevie G. Review Revue @ Bar Deville. i’ll break your legs if you stop me dancing. I am shocked I only watched two movies this week. Damsels in Distress was truly bizarre. There were some very funny moments in it, but it didn’t feel cohesive as a film, like something was missing. Greta Gerwig reminded me of Alicia Silverstone in Clueless, working towards causes she believed in that truly miss the point. Similarly, this film didn’t know what point it was trying to make. I don’t think I ever want to show anyone The Room at home ever again. I knew that crowd participation is a large part of why it’s so incredibly funny & enjoyable, but Jason wanted to watch it and we indulged him. Pretty sure he thought Steven and I were big dorks talking to the screen, but he already knew we were dorks. Oh well, lesson learned. Don’t throw spoons at your home tv! 2014 Week 23: Meet Miss Art3mis! Big news this week was that we rescued a new hedgehog and named her Art3mis after Ready Player One by Ernest Cline, which Z still needs to read. 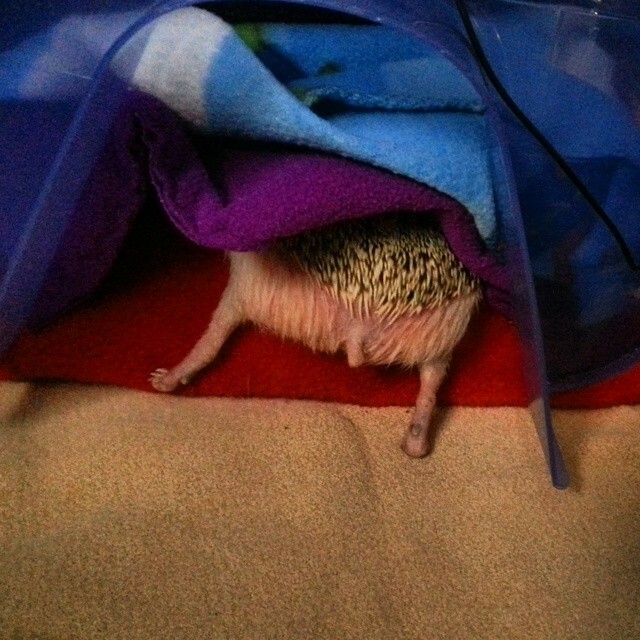 We adopted her through the Hedgehog Welfare Society. We had been on the waitlist for a girl hedgie for awhile and our friend Christina drove up to Beloit to put this one up – the owner had passed and left, I believe, two other hedgies and a macaw? Art3mis is a very large hedgehog and overweight, but she runs A LOT – inspiring! Z and I’ve been working to socialize her and slept with fleece which we’ve put into her pigloo to familiarize her with our sent. She’s in quarantine for a month to make sure she doesn’t have anything contagious to pass on to Katniss. Then she’ll go into the condo unit below Katniss. We can’t wait to see if they’ll be hedge friends, though my guess is they’ll just tolerate one another. Can we talk about how excited I am for this Beverly record to come out July 1st? I know I posted it in my rambling Rocketship post from last week, but I think it’s real good, yinzers. I swear I watched All that Jazz in the last few months, but I didn’t journal it, so perhaps I dreamed it? Still good again – some real pretty dance numbers. I think the first time I was just looking for something to watch, but this time I watched it knowing that Bob Fosse directed it about his own life. To direct a movie about your own life and downfall and how bad of a person you think you might be; that is pretty bananas. Jodorowsky’s The Dance of Reality was one of the most tame films of his that I have seen, but I am not done with his back catalog – Z and I started watching them from the beginning, but there’s just not enough time in the day. The Kings of Summer was quite good. It reminded me of a childhood favorite, the Sandlot, with a great mix of bitter and sweet. Also, it’s fun to see Moises Arias, who played Rico from Hannah Montana, growing up on film. He is becoming a really good actor. And speaking about dudes building a house in the middle of nowhere, why would I not link to this Drums live performance on KEXP because they’re going in to record a new album soon and HI, they are so great! This week was a doozy: Sushi Station/Mitsuwa with Z, Jen S., and Stacy. Edward Gorey exhibit @ LUMA. Small Bar with Kelly, Heather & Jim. Squasht opening party with Kimmi. Printed a new card! Flew to NYC and headed straight to dinner with Kevin and Amy Plitt at Taco Chulo, followed by cookies at Momofuku Milk Bar. Then straight to The Flatmates/My Favorite/The Haywains @ Knitting Factory. Lunch with Kevin & Niko @ Wild Ginger and a walk to Cafe Grumpy. Afternoon show @ Spike Hill, but we left for Maleficent in Union Square. Quick dinner of pizza @ Two Boots. 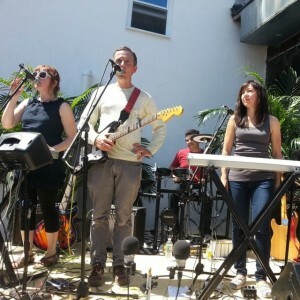 Band A Part/Rocketship @ Cameo Gallery – it was hot as hell and I couldn’t be in there any longer than I had to. Sunday morning, Kev and I headed to brunch at Bar Bodega and met up with Jen Ferreira and her friend Fay, Molly Cronin, and Terence Adams (who I have not seen in forever & ever)! Last, but best: Rocketship/Pam Berry/Mark Monnone/Beverly (Beverly were amazing – song link here) @ Trans-Pecos. I ubered it to LaGuardia and pretty much still haven’t decompressed three days later. 99% of the reason I flew to the NYC Popfest was to see Rocketship, a band I have loved ~15 years since an ex Victor put them on a mixtape. Seeing so many of my awesome friends and fantastic bands and eating tasty food made up the other 1%, but let’s be real – I did it for Rocketship. Often when I mention them, I get a lot of blank stares, even from rabid music fans so, being in a space inhabited by super fans of Rocketship was thrilling. They were filming a documentary about them and I told my story of discovering them. The Saturday night show was great, don’t get me wrong, but the sound and setting and crowd on Sunday at Trans-Pecos was absolutely magical and NYCTaper recorded the magic and put it up here. I believe I did a good job of not embarrassing myself when I told Dustin & co. what finally getting to see them meant to me. A great history of Rocketship’s discography. 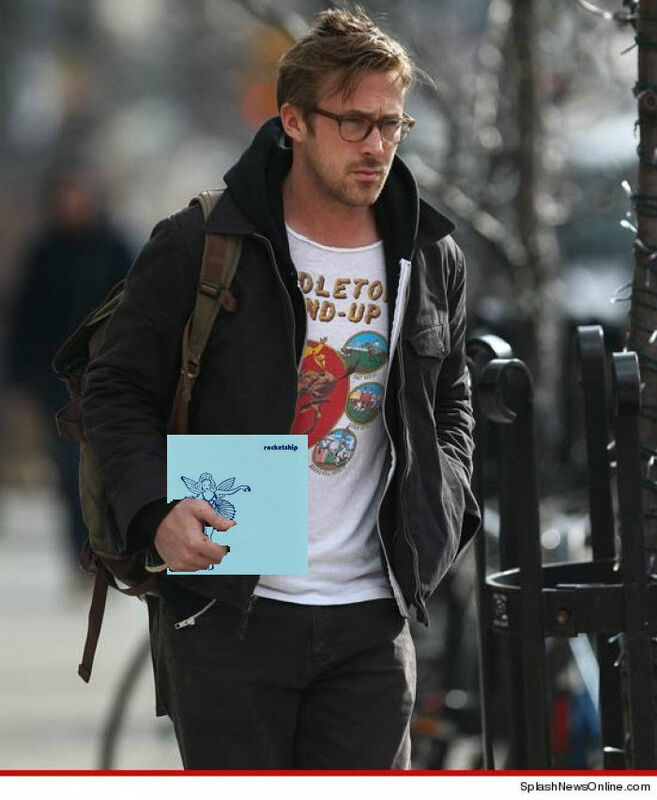 Q: What’s Ryan Gosling’s favorite song? A: Hey Hey Girl. Duh.